Another day, another goalie on waivers. Any takers? The Philadelphia Flyers have placed 24 year old goaltender Anthony Stolarz on waivers for the purposes of assigning him to the American Hockey League’s (AHL) Lehigh Valley Phantoms. Anthony Stolarz (PHI) is on regular waivers today. 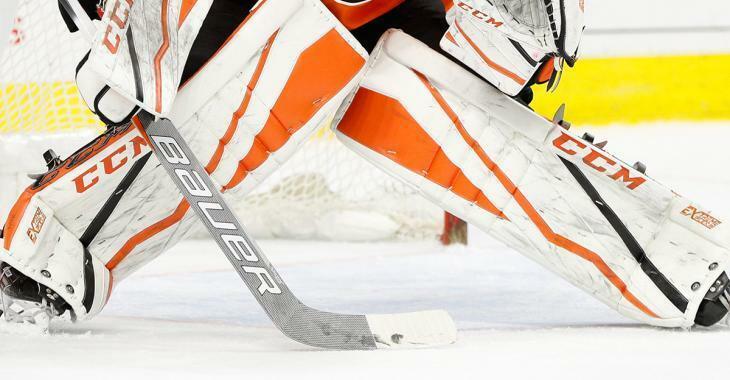 The former second round pick (45th overall) of the 2012 NHL Entry Draft was once considered the top goaltending prospect in the Flyers organization, but has since taken a back seat to super prospect Carter Hart. The 24 year old Stolarz barely played last season after suffering a torn meniscus and spending the majority of the year recovering on the injured reserve. In total he played just four games split between the Lehigh Valley Phantoms and the ECHL’s Reading Royals in 2017-18. It’s expected, should he clear waivers, that he’ll split the crease with Hart in the AHL this season. In hist last full season of pro hockey, Stolarz established himself as a solid prospect, earning 21 wins in 47 starts with the Phantoms in 2015-16. He posted a 2.07 goals against average and a .928 save percentage that season, but only managed to get into 29 games with the Phantoms in 2016-17. Again, his 2017-18 campaign was almost a complete write off, so it’s clear to see how Stolarz’s stock has fallen so precipitously. Of course, the Flyers picked up former Toronto Maple Leafs goaltender Calvin Pickard off waivers earlier this week. To say that the Flyers have a bit of a logjam in the crease is a major understatement. Brian Elliott is the uncontested starter (for now), while Michal Neuvirth and Pickard battle it out for the back up spot. Then there’s Alex Lyon… and Stolarz… and Hart. While most people expect Hart to be the heir apparent in Philly, he has five goaltenders ahead of him on the team’s organizational depth chart. We’re willing to bet that Flyers general manager Ron Hextall wouldn’t be too upset if someone were to take a flier (pun intended) on Stolarz. If not, well it never hurts to have too many capable goalies in your system... particularly if you're the Flyers and you have a history of poor goaltending.